State One Fire is the one stop shop for all your fire protection services. We provide the best training in Fire Safety and Emergency Procedures that is tailored to your individual business needs, plus fire protection solutions. State One Fire offer a range of fire safety training and emergency training courses to give your staff the skills and confidence to make the right decisions and act quickly in the event of a workplace emergency. Our Sister company, Evac You 8 is a Registered Training Organisation (RTO) with certified trainers who can confidently guide your staff through practical theory, and hands-on, learning experiences. Our trainers have a wide range of military, security, emergency services and corporate background including working with persons of non-English speaking or English as a second language background. We tailor make training to suit your organisation with real emergency situations; because the impact of a crisis can be substantially reduced when people are trained to respond appropriately. Developed to cover a broad range of emergencies as considered in AS 3745-2010. Includes information relating to roles and responsibilities, duties, evacuation procedures, bomb and substance threats, and emergency response procedures. Training specific to the control and/or limit of an emergency situation; including practical use of fire equipment on a controlled fire simulator and chemical spill kit. Training focuses on the identification, prevention of and responding to potential workplace emergency situations. Various emergencies are covered including the progression of emergencies. This course educates participants about the relevance of fire safety and provides the opportunity to develop operational techniques when using fire equipment in the workplace. A lockdown is the procedure for when staff and students must remain inside due to a threat outside the building. During a lockdown, staff and students must be regularly updated about the current situation, preferably every 15 minutes. Training designed for the practical application of firefighting equipment. In class training also touches on preparing for fire situations, understanding fire hazards, emergency response, and personal safety when fighting fires. Trainer observed and conducted emergency exercise. Includes a pre- and post-exercise brief. Designed to help people respond to and deal with a bomb or substance threat in accordance with AS 3745-2010 and includes: What to do, how to respond, what not to do, search techniques and evacuation procedures. Specialised training course that focuses on methods of preventing armed holdup and in the event of this occurring the manner in which to respond and then deal with the after effects that this type of emergency may cause. Hands-on experience of how to deal with a kitchen fire situation. You will learn to use different types of firefighting equipment on a real fire using our specially designed Kitchen Fire Simulator. General Staff responsibilities in emergency situations, what to do, who to evacuate first, where you need to evacuate to. Training contains facility specific information. Designed for staff who have to enter into someone else’s home in order to administer care. Includes information relating to: Home Evacuations, Electrical Safety, Housekeeping etc. Training designed for Emergency Planning Committee members and Chief Wardens to enable them to execute their responsibilities and obligations in accordance with AS 3745 -2010. Training designed for the practical application of firefighting equipment. In-class training also touches on preparing for fire situations, understanding fire hazards, emergency response, and personal safety when fighting fires. This is considered a basic course suited for Self-Care / Live-In Residents and covers information relating to Emergencies. Training can be modified to suit individual facilities. Specifically designed to induct personnel to a building and includes an assisted Practice Evacuation Exercise. Trainees are split into two teams and are asked to evacuate to the assembly area. Different emergency scenarios are covered in order for trainees to respond differently to each situation. This course applies to employees in the NSW public health facilities, private hospitals and day procedures centres, and other health and aged care organisations who are delegated the responsibility of Fire Safety Officers. 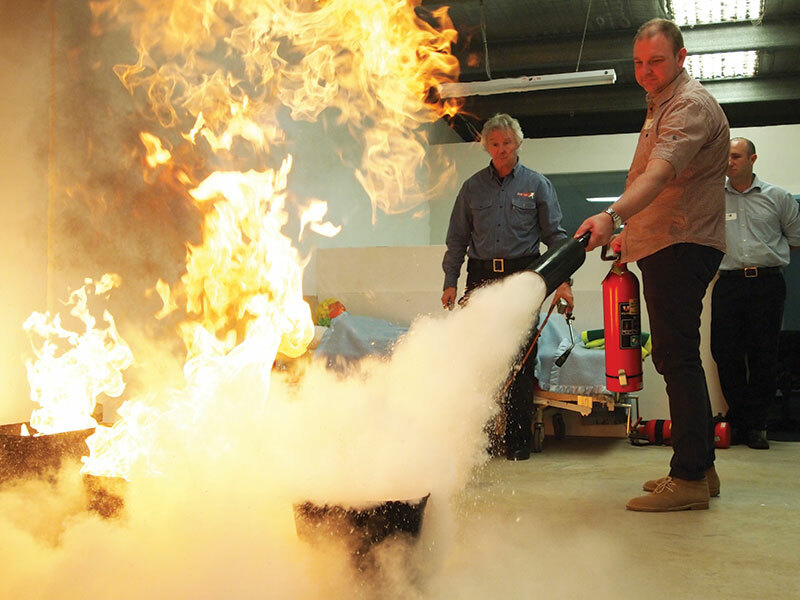 This course includes skills and knowledge as required by the Policy Directive for Fire Safety in Health Care Facilities as set out by NSW Health. This will also benefit Chief Wardens or others tasked with this role in a business. For more information please contact 1300 738 133 for the Course Outline.